We don't eat much pasta in the summer because it's often heavy, especially because I prefer cheesy pasta dishes or cream based sauces. But I stumbled upon a recipe for a pasta dish (Epicurious) using an uncooked sauce of olive oil, vinegar, garlic, and herbs, and was intrigued by how light and fresh - almost refreshing - it sounded. I made it last night with just a few revisions. Bring a pot of salted water to a boil for pasta. 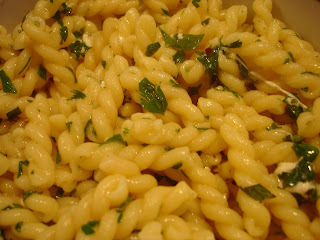 Cook pasta in boiling water, stirring occasionally, until al dente and ladle out and reserve pasta water. Drain pasta in a colander. Mince garlic and chop herbs. Quarter large bocconcini and halve smaller ones (or chop large fresh mozzarella into tiny pieces). In a large bowl toss cheese with garlic, herbs, red pepper flakes, oil, and salt to taste. Add hot pasta and 1/4 cup reserved pasta water, gently tossing (and adding more pasta water as needed if mixture becomes dry) until combined well. 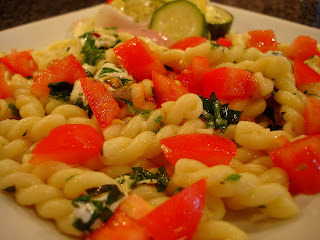 When serving the pasta, I topped mine with some chopped fresh tomato (pictured at top). Fresh herbs, especially in this quantity and use, give such a light and summery flavor to dishes. I will make this one again, and may play with the herbs, seasonings, and vegetables that I incorporate. On Tuesday night we roasted a ton of veggies - summer squash, zucchini, red onion, green pepper, red pepper, garlic, tossed with olive oil, white truffle oil, Kosher salt, pepper flakes. I warmed them up tonight and served them alongside the pasta. Looks great and so colorful. In the summer I prefer the lighter pasta salads as well - thanks for sharing! This looks really good, and I LOVE garlic so I will have to give it a try!